Thanks to your needs and requirements, you enable us to do what we love! We at Willing Care get a thrill out of a job well done, this is achieved by simply finding our clients the perfect candidate. Finding you the perfect candidate comes naturally to us because we Care, we are Willing and we are able. Through our extensive existing network, utilising optimum search criteria and candidates who value what we do so much that they refer friends and colleagues to us, we connect with candidates far and wide and get to truly understand them and what they can bring to your service. 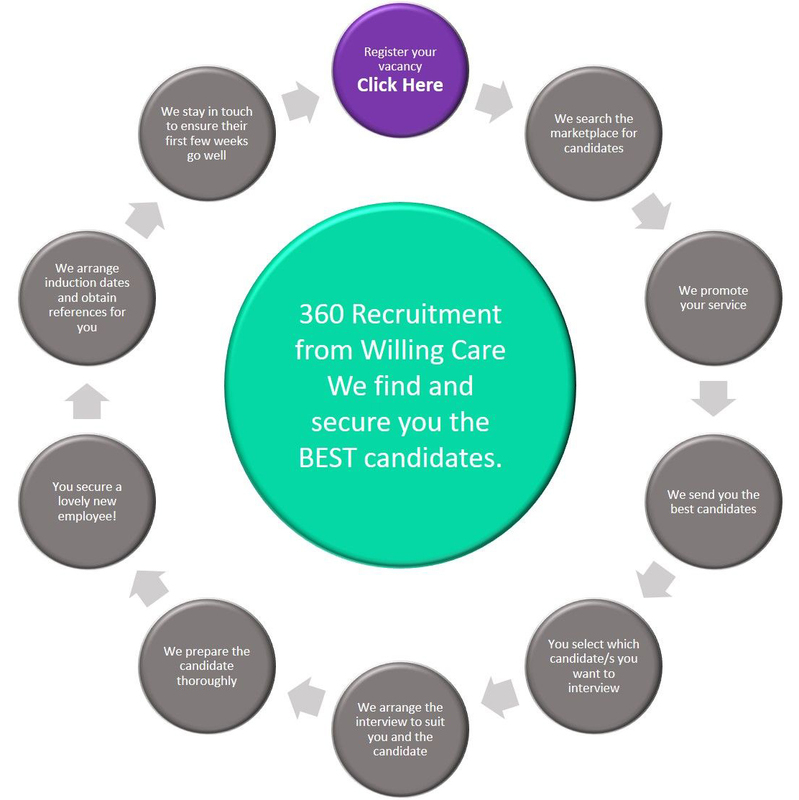 Through taking the time to understand exactly what you are looking for from your next employee, we are able to find and secure you the ideal candidate. We are Willing to go the extra mile to ensure we understand you, your organisation and your procedures. When you need it to, your recruitment process becomes our recruitment process. Ultimately, we want your recruitment journey to be as easy as possible, this enables our candidates to have the most enjoyable experience - why do we do this? Because we Care! Through acting as an extension of your organisation, we get the candidates you want through your door. We at Willing Care are a team of highly experienced recruitment consultants and understand the best candidates don't stay on the market for long. We work quickly and effectively to advise candidates of opportunities that are both suitable and appealing. We work closely with you to understand the role and accompanying benefits to represent you accurately and positively. Our candidates arrive at your interview prepared and eager, due to the thorough preparation we provide, this comes not only from years spent in the industry but also due to the close working relationship we establish with our clients. We will only ever provide compliant and competent, qualified candidates and you can rely on us to keep the lines of communication honest and open throughout the process. You won't need to advertise, we at Willing Care have many channels to use for specific roles that have shown demonstrable results. Once you have selected the candidate/s for interview, we will work with you to schedule a time and day that suits all parties. We work with you to ensure the candidate has a fantastic recruitment journey with your service and we work with our candidates to bring their A game when they meet you. We at Willing Care don't believe that the job is done until your lovely new employee is settled in their new role. We stay in touch with our candidates after an offer is made and accepted and offer services to aid a smooth induction. Whether that's obtaining references, arranging shadow shifts or just finding out a uniform size, we are here as long as you need us. If you are interested in registering a vacancy with our organisation please email us at recruitment@willingcare.co.uk or call us on 01183 800722. All responses will be followed up with a phone call to discuss in more detail.